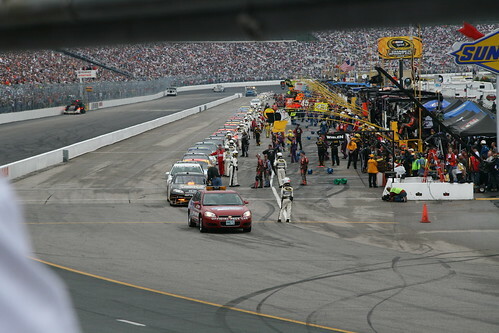 mommy bytes: Photo Story Friday - NASCAR! 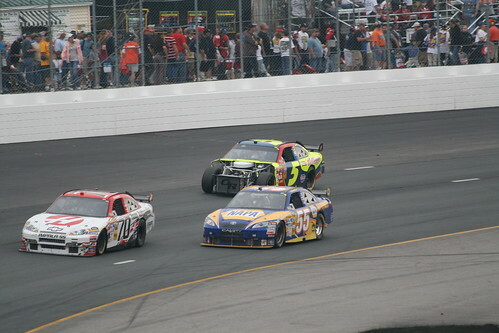 Photo Story Friday - NASCAR! I took Adam to the Sylvania 300 NASCAR race up in Louden, New Hampshire a few weeks ago. As you can see, we had great seats and got some great shots, but it *almost* didn't happen. Since it had been raining all morning, I stopped at Target first to pick up a raincoat for Adam, as umbrellas weren't allowed according to New Hampshire Motor Speedway's website. I had a backpack full of camera equipment and radios, so I simply took my wallet and car keys into the store. We quickly found a jacket, paid for it and walked back to the car. We drove the hour or so up to Louden and then ran into the inevitable traffic. At this point I reached over for my wallet, but it wasn't in my backpack. I pulled over to look for it and couldn't find it anywhere. I called Doug in a panic, and tore the car apart for 15 minutes. How could I lose my wallet that was clutched in my bare hands the entire time? Did I drop it in the parking lot at Target? I called Target and they didn't have it in the lost and found. Since I was traveling for work the next day, I had all my corparate credit cards in there as well. Plus how was I going to rent a car without my driver's license? I finally decided that we would still go to the race and leave when we were starving from not eating lunch. 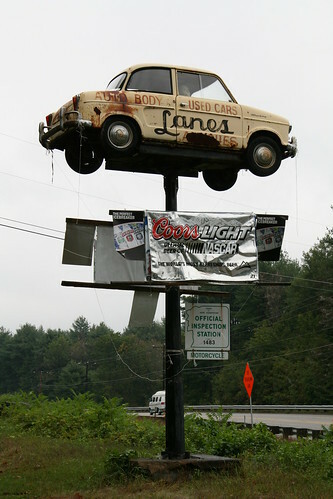 As we got closer, it was apparent that I would have to pay for parking and I wouldn't be able to do so, so we turned around and stopped one last time at Lanes Auto Body. After 10 more minutes, I finally spotted my wallet after sticking my head under the passenger seat from behind. Whew! What a relief (and what a total ditz I am!). We were finally on our way to the race. At the gate there were hundreds of confiscated umbrellas, so at least I got that right. As we were walking to our seats, Senator John McCain came on. I was surprised to hear boos as well as cheers from the audience. I was just glad that his address was short. 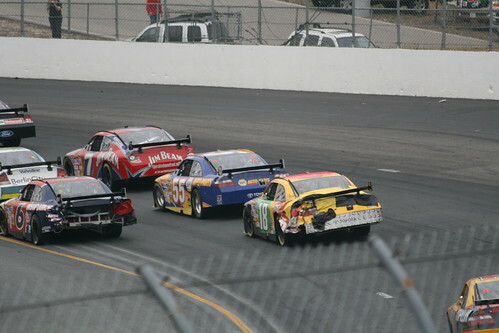 As we walked to our seats I snapped this shot of the cars lining up in the pits through a slot in the fence. And now for the race. The visceral feel of the cars rumbling by was the most unforgettable sensation. You could feel it in your chest. Our ears were protected by ear plugs (despite Adam's complaints about itchiness), so we could feel it in our bodies more than we could hear it. I tried to listen in to the pit radios that a colleague lent me, but the endless "Clear!" after each turn was a bit monotonous. I was able to hear the radios with the headsets and earplugs on (you can never have too much hearing protection). I noticed that Doug left me a voice message on my cell phone, so I tried to play it on speakerphone, held it up to my ear (with earplugs), but heard absolutely nothing. It was really that loud at the race. 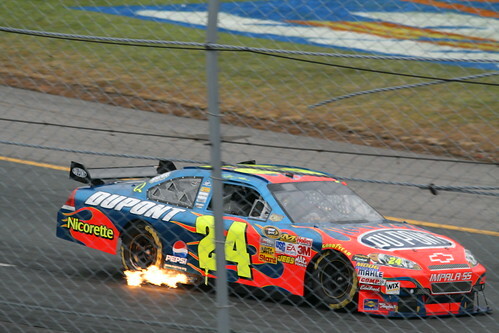 Flames from the exhaust. Adam was rooting for Jeff Gordon, but he never placed higher than 6th. After around 100 laps, Adam seemed to have enough and asked if he could play his Nintendo DS, so I took this opportunity to finally get some lunch. 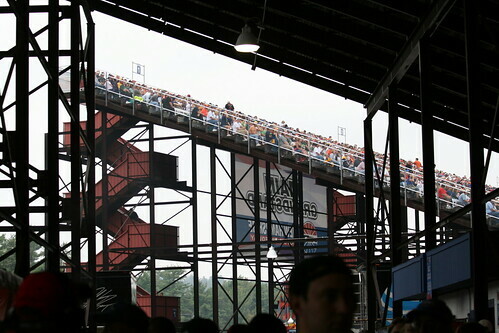 View of the stands from underneath. They were pretty full but not sold out. After lunch, Adam still asked to play his video game so I finally caved around lap 170. That way I could concentrate on taking pictures. 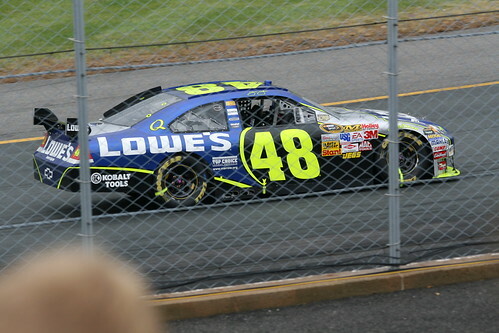 Jimmie Johnson was favored to win. 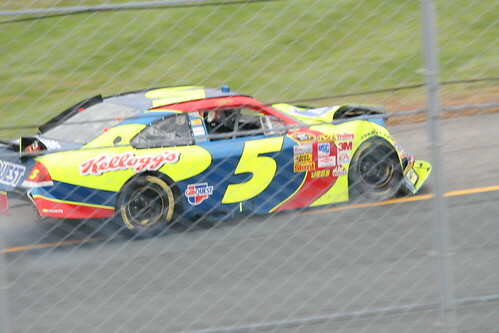 Casey Mears just after his crash and before he pulled into the pits. David Ragan (6) Kyle Busch's M&M car (18) after they crashed up. Lots of duct tape is used in NASCAR! Casey Mears' team finally gave up on the duct tape and decided to run with no hood or front fenders. 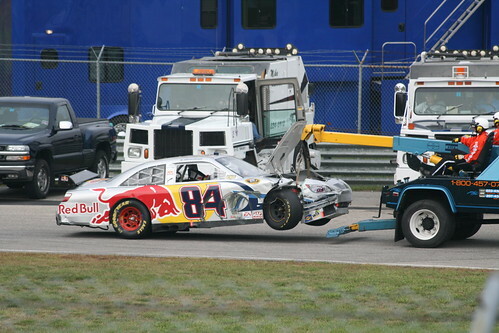 The only casualty that had to be towed off the track. It was a race with many crashes to Adam's delight, but also many laps run under the yellow flag. I wasn't sure how much Adam got out of the race, because he basically shut down from the overstimulus halfway through. But when we got home, he immediately took out his NASCAR toy cars (many of which were actually at the race) and proceeded to set up all the crash scenarios. So he loved it and I am so glad we had this experience.